Support LDCs’ efforts to develop information systems which record, at the recipient country level, indicators and other relevant information relating to aid effectiveness, both for individual donors and for the donor community as a whole, by providing logistical equipment for establishing such information systems and training and the maintenance of such systems. 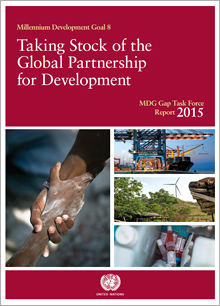 0.15-0.20% of donor GNI provided as aid to LDCs, equivalent to $66.8–89 billion (in current dollars). 0.10% of DAC GNI in 2013, equivalent to $44.5 billion (in current dollars). Between 0.05 and 0.10% of DAC GNI, equivalent to $22.3–44.5 billion (in current dollars). Commitment reaffirmed at subsequent UN and other international conference and summits, including the Fouth UN Conference on LDCs in 2011 in the Istanbul Programme of Action for the LDCs for the Decade 2011-2010. Download the Istanbul Programme of Action for the LDCs for the decade 2011-2020 here [pdf].